If you’re in an orthopedic walking boot, don’t let rain, sleet, snow or sand stop you from getting around. At CastCoverz!® we’ve got products that will protect your boot AND keep your toes clean and dry or toasty warm in extreme weather. BootGuardz! Boot covers for rain and sandy beaches. 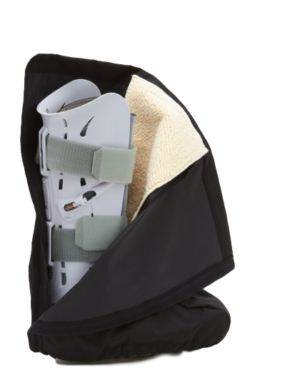 Our line of orthopedic boot covers are designed to protect your walking boot, boot liner, and toes from rain AND even walking on a sandy beach! They are Made-in-the-USA using weather resistant material and a proprietary design. Your boot’s tread will remain exposed so you can safely navigate inside and outside. Don’t worry! Your BootGuardz! is designed to securely anchor the cover to the sides of your boot. There are a total of 7 fabrics available. Check them all on our BootGuardz! page. We recommend adding the optional sewn-in toasty liner to keep your toes warm. BootGuardzXtreme! 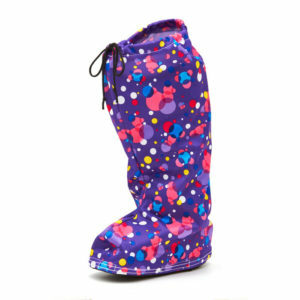 Boot covers for snowy, frigid conditions! Brrrrrrr! We know that BootzGuardz! and BootGuardzXtreme! look like twins but they are totally different designs. BootzGuardzXtreme! is the best boot cover for EXTREME conditions. These are weatherproof, water-resistant covers for your orthopedic walking boot to protect your boot and toes from wind, rain and snow. The sole/tread of your orthopedic walking boot is exposed for proper footing and safety. 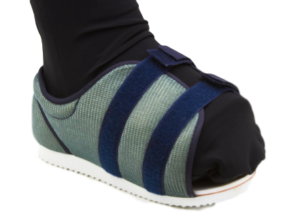 If you have a post-op shoe or sandal (see picture) please contact our office, directly, for proper sizing. No zippers on our cover means easy on and off and no frozen zippers! 2 hook and loop strips ensure an adjustable, snug fit. We recommend adding the optional front-panel toasty liner to your BootGuardzXtreme! to keep your toes and leg warm. Slickerz! Weatherproof covers for leg casts. Got leg cast? Our Slickerz! 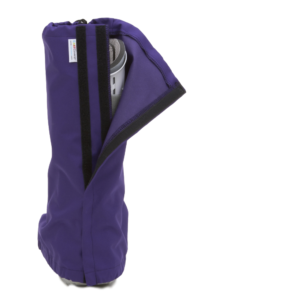 cast covers are designed to keep your cast and toes clean and dry from rain, slush, and snow (and sand, too!). Made for non-weight bearing casts, you can check out our designs and learn more about Slickerz! here. Rain, wind, sleet, snow (and even sand), our BootGuardz! and BootGuardzXtreme! will keep your orthopedic boot dry and your leg, foot and toes warm and toasty. Slickerz! will keep your leg cast dry and your leg and toes warm, and toasty! At CastCoverz! we know that a warm, dry boot (or cast) can make the difference between a good day and a GREAT day! ‹ Happy Thanksgiving from CastCoverz! I’m impressed, I must say. Rarely do I come across a blog that’s both equally educative and entertaining, and without a doubt, you have hit the nail on the head. The issue is something which not enough folks are speaking intelligently about. I’m very happy that I found this in my search for something concerning this.